Combining theory, comparative politics, and international relations, Introduction to Politics provides a perfect introduction to the subject for students embarking on university-level study. As the only introductory text to cover both comparative politics and international relations, and contextualise this material with a wide range of international examples, it is the most comprehensive, authoritative, and global introductory politics textbook on themarket. Written by three experts in the field, this book takes a balanced approached to the subject, serving as a strong foundation for further study. 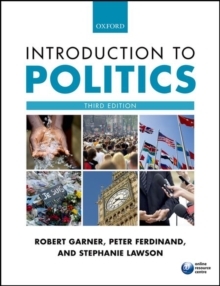 The material is explored in an accessible way for introductory study, but takes an analytical approach which encourages more critical study and debate, helping students to develop the vital skills they need for a politics degree. For students - Learn more about the people behind the theory with the 'Key Thinkers' resource. - Test your understanding of the chapter content and receive instant feedback with self-marking multiple-choice questions. - Revise key terms and concepts with an online flashcard glossary. For registered lecturers - Encourage students to think critically with political scenario exercises. - Reinforce key themes from each chapter with suggested discussion questions for use in seminars. - Use the adaptable PowerPoint slides as the basis for a lecture presentation, or as hand-outs in class. - Save time preparing assessments and seminars with a fully updated test bank of questions.